. Published on December 29, 2014 . 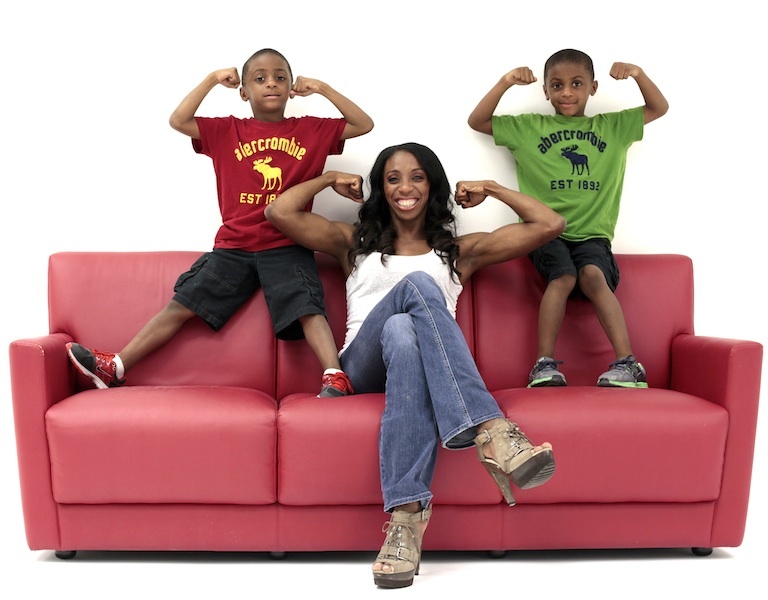 Lashinda Demus is a a professional track and field athlete and mother to twin boys. She’s the American record holder in 400m hurdles, was the 2011 world champion, and won the silver medal in the 2012 Olympic games in London. She recently started a web site, Go Woman Go! to inspire and connect with other women. The name of the site was inspired by her sons, Dontay and Duaine, whose voices were heard on NBC coverage of the 2012 Olympics, yelling “Go Mommy GO!” as she came down the homestretch of the 400m hurdle final. We were thrilled when she agreed to give us a glimpse at her fast-moving life and training habits! How do you start your own day? I wake the twins up around 7am and send them directly to the bathroom to wash their face and brush their teeth. While they are doing that, I iron their school clothes and start breakfast. As they are putting on their clothes and eating breakfast, I then get ready for training and prepare a light but highly impactful breakfast: egg and avocado sandwich or oatmeal with a protein shake. I always eat on the go so I’m normally munching on my breakfast as I drop the boys off to school. Right after drop them off, I fight Los Angeles traffic to get to my training session. I have recently turn into a vegetarian. Not a decision made because of training, just a personal one. I just woke up one day and decided to listen to all the woes of meat and said I’ll try this out, with no pressure attached. Protein is a big deal when you delete meat from your diet, so what I do just to make sure I receive enough protein is supplement a shake in the morning and before I go to bed. There’s so much research being done and advice being published, how do you tell what’s real and what’s fake? This is simple. Nothing good comes easy!! So don’t believe anything that has you getting results in some crazy timeframe. It’s about making healthy habits a part of your daily LIFE. There are so many different fitness regimens. As long as you work out, do SOMETHING, I think you are on the right track. Definitely find out what agrees with your body. Look at how your body recovers and your energy levels the following day after a workout. The most important thing is consistency. With diet, I think it’s pretty straightforward: eat in moderation and eat more vegetables than anything else. I’m not a person that gets all caught up in counting calories. I just try to put good things into my body so that I don’t have to worry about how many calories I had for the day. That’s not to say I don’t eat things that aren’t necessarily good for me. There’s a time for everything! I’ve recently started a blog that I’m so excited about, www.gowomango.com. I just give my advice and my ideas of how to handle different life occurrences and also to have an open dialogue with and among women. I’m excited to see where this blog goes in the future. No matter what, I follow through with the workout at hand. There are going to be workouts where you’re more tired than other times but all I do is make sure that my effort is exactly the same as when I’m having a better day, because you receive the same benefits. My body doesn’t register times on stopwatches—it registers energy I’m expending and muscles I’m working. So I’m even getting good on a bad day. One thing that top performers have is the ability to accept and compete through pain. They mentally conquer pain and learn to live with it. I discussed this more here: How to Handle Pain (and Stress). Being able to push past pain will take you to another level of fitness and performance. Eat Vegetarian: join others who find optimal health by following a plant-based diet. Eat More Vegetables And Fruits: enjoy more flexibility than strict vegetarian, yet be sure to get your healthy foods every day. Eat Breakfast: fuel your body in the morning to get off to a great start.